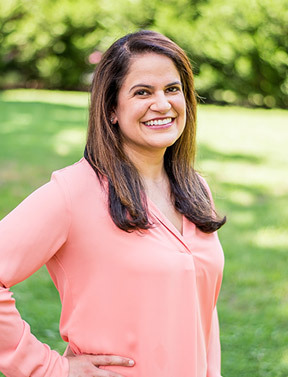 Dr. Sonia A. Karamchandani, although born in Rockford, Illinois, has been calling the Upstate home since her family moved to Greer while she was in middle school. Dr. Karamchandani went to Northwood Middle and graduated from Riverside High School. Dr. Karamchandani attended the University of South Carolina-Honors College where she earned her Bachelor of Science degree in Chemistry and was honored Phi Beta Kappa. She earned her Doctor of Dental Medicine degree from the Medical University of South Carolina College of Dental Medicine. While at MUSC, she was presented with the Academy of General Dentistry Senior Student Award which is awarded to the student who exhibits the greatest interest, knowledge, and proficiency in the field of general dentistry. Subsequently, Dr. Karamchandani completed the prestigious University of Florida-Advanced Education in General Dentistry residency program. This residency works closely with renowned training programs, including The Dawson Academy for Advanced Dental Studies and The Pankey Institute. She completed numerous hours of advanced continuing education in implant, surgical and cosmetic dentistry with a focus on solving complex restorative and bite problems. Dr. Karamchandani focuses on comprehensive treatment and enjoys working on smile design. Dr. Karamchandani was honored as a Fellow of the Academy of General Dentistry. Fellows of the AGD must have completed 500 hours of continuing education and also have passed the AGD exam. Dr. Karamchandani is a member of the American Dental Association, South Carolina Dental Association, Academy of General Dentistry, American Equilibration Society, Greenville County Dental Society, and Piedmont District Dental Society. She is currently serving as the President-Elect of the Piedmont District Dental Society. She resides in Greenville with her husband, Amit Toprani, a native of Easley. He works as a Business Unit Manager for Champion Aerospace in Liberty, SC. They were married in June of 2012, and they were blessed with the birth of their son, Jayan Toprani, in May of 2017. Dr. Karamchandani enjoys traveling, reading, cooking, spending time with friends and family, and giving back to the community through organizations such as Greenville Free Medical Clinic, Dentistry from the Heart, and the Junior League of Greenville.